Discover a new flavour to add to your finger food repertoire with these quick and easy stuffed mushroom snacks. Preheat the oven grill. Wipe the mushrooms and remove the stalks. Finely chop the stalks. Blanch the spinach for 1 - 2 mins in boiling water. Immediately immerse in cold water and drain well. Heat 15ml (1 tbsp) of the olive oil and fry the bacon and onion until browned. Remove from the heat and stir in the chopped mushroom stalks, spinach, egg yolk, breadcrumbs and oreganum. Season with salt and pepper. Brush the mushrooms with the rest of the olive oil and spoon the mixture onto them. 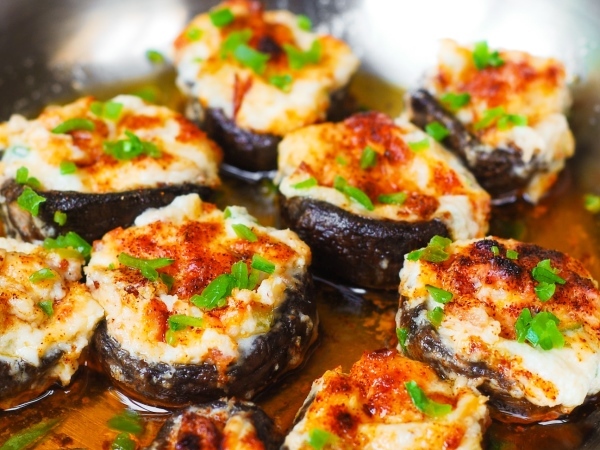 Crumble the feta cheese over the mushrooms and grill for 3 - 5 mins or until golden brown.